A 29r that embodies the soul of a classic yeti trailbike. Built with our switch technology. Admittedly, we were a bit late to the game on embracing 29'r platforms. It took us three years and countless prototypes to create a bike that we feel embodies the characteristics of a true yeti trail bike. We started with our new switch technology to create a platform with crisp pedaling and efficient bump absorption. Our unique suspension design was coupled with a progressive geometry (slack and low) that gives the bike a lively, yet planted feel on the trail. The net result is a bike that climbs extremely well but descends even better. The switch technology sits low and compact on the frame so we can use a low-slung top tube to create added stand over clearance and accommodate smaller riders. Additionally, our suspension platform and its unique wheel path allow us to build the sb95 with very short chain stays, a key to achieving the ride characteristics we are used to on our 26'' bikes. The result is a bike with a decidedly yeti feel - it has loads of tire clearance, corners quickly and descends technical terrain confidently - while still reaping the benefits of its 29'' wheels. The lowdown on the sb95 and its features. 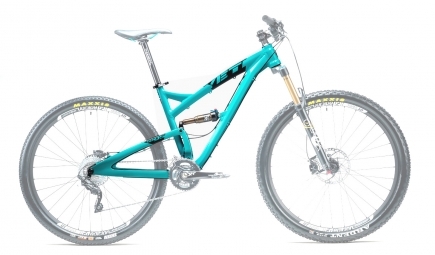 YETI 2014 Cadre SB 95 Aluminium Turquoise + Amortisseur Fox CTD Adjust clasificado 5.0 de 5 por 1. Rated 5 de 5 por derkas974 de Super vélo Super polyvalent. Bon partout. Maniable même pour un 29. Confortable. Bonjour,j'ai fais l'acquisition d'un sb 95 sur votre site l'ann&eacute;e derni&egrave;re les roulement de suspension sont hs le triangle arri&egrave;re a beaucoup de jeux pourriez vous m'indiquer ou me les procurer,par avance merci.